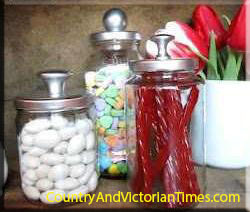 Use empty mayonnaise and pickle jars to store spices in the kitchen or crafts. Clean jars completely and dry. Attach wooden drawer pull (hardware stores have these for about 50 cents) with E6000 and let dry. You can also add a screw from the inside of the lid into the drawer pull for a secure lid. Spray paint the lid/drawer pull with a color of your choice and let dry. You might want two coats on here to give a nice covering. Spray or brush a clear coat of polyurethane to make sure the paint does not get scratched off. This entry was posted in Crafts ~ DIY ~ Projects, Home, Car, Yard, and Pets, ~Home, ~Recycle & Upcycle, ~Sewing and tagged brush, Color, coordinate, craft, crafts, drawer, Drawer pull, dry, e6000, findings, Hardware, Home and Garden, jar, kitchen, lid, mayonnaise, paint, pickle, polyurethane, pull, spray. Bookmark the permalink.